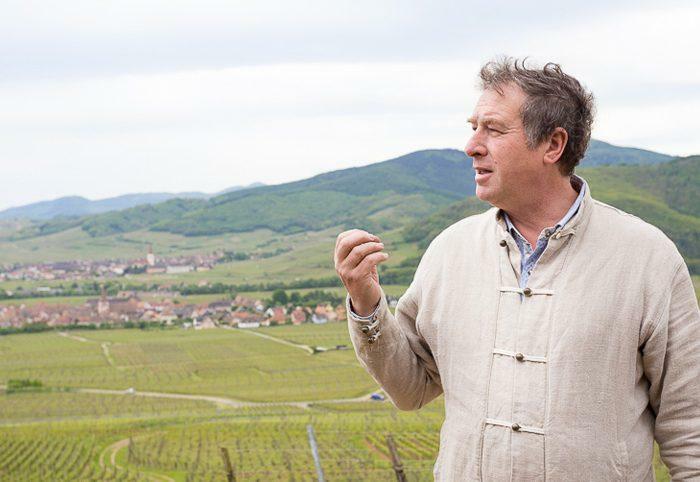 The Paul Blanck estate traces its history in Alsace back to the 17th Century, where they produce a stunning and diverse lineup of wines from enviable parcels in the Haut-Rhin district of Alsace. Located in the village of Kientzheim, Domaine Paul Blanck produces wines that are balanced, terroir-expressive, and versatile. Owners Frédéric and Philippe Blanck farm ther vines without the use of chemicals, seeking to gain the clearest possible expression of vineyard character. From the chiseled, sumptuously mineral Schlossberg to the opulent and broad Furstentum, Blanck's Grand Cru offerings rank with the best in the region. His single-vineyard (lieux-dits) wines from such sites as Patergarten and Rosenbourg are comparably top-flight, and his line of everyday 'Classique' wines show the versatility and breadth of the Blanck range. Wine Spectator 90 "Crisp and minerally, this linear white has a lip-smacking palate of crunchy white peach and pear fruit, accented by apple blossom, ginger and pleasing salinity on the lingering finish.” Wine Information: From a vineyard of sand and gravel. Around the village of Kientzheim. Wine Spectator 92 "Refined and silky, with smoke and mineral notes underscoring the juicy flavors of dried papaya and apricot, anise, beeswax and lemon preserves. The lasting finish echoes a note of zesty ground spice. Drink now through 2023.—A.N." Wine Information: Soil: Gravel, south-facing.